I came across the book "Millionaire Teacher" when I was in Kinokuniya last week. Either the glossy cover or the author's name "Andrew Hallam" that attracted me to it. I ended up buying and reading the book. 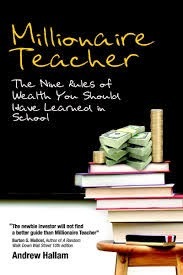 To me, it's not a book that teach us how to be a millionaire, instead it's a book about a teacher who becomes a millionaire. This book basically says that everybody can be a millionaire, despite being just an average salary man. I won't divulge much in my blog, but I think it's a good read and it's a must read. Everybody who is serious about achieving success in their personal investing journey must read the book. Even my boss already told me that he would borrow mine after I finished reading. After reading this book, I'm determined to tweak my investing style. No more bearing with the platform fee nonsense. No further contribution into my unit trust portfolio. New contribution will be directed towards a new low cost index portfolio. Gradually, I'll shift my portfolio from the "expensive" unit trusts to low cost index. Period. Good bye blood sucker. Sounds like a book worth checking out, will add it to my to-read list. Hi RetailTrader, it's definitely worth for me. I hope it will be worth your time too. I'm glad you had your mind-flip moment or epiphany! I hope we will meet in person one day :-) ... May be you'll share a trick or two with me while we have coffee. By the way, you new profile pic power!